Hello my booklover friends! I am so excited today because one of my most anticipated books of the year that I pre-ordered arrived on my doorstep this morning. Today, the next and I believe final book in the Lunar Chronicles was released. I am jumping up and down with serious book love right now. I can’t wait to see what will happen next. I am also pleased that the book is a chunker. So that means I can stay in that world a little longer. I am currently reading a book club book and have about 100 pages left so I am going to crank it into high gear so I can start Winter tomorrow. The beauty of pre-ordering with Amazon is the price and that they arrive on your doorstep the same day the stores release them. I didn’t even have to leave the comfort of my home. Simply divine! 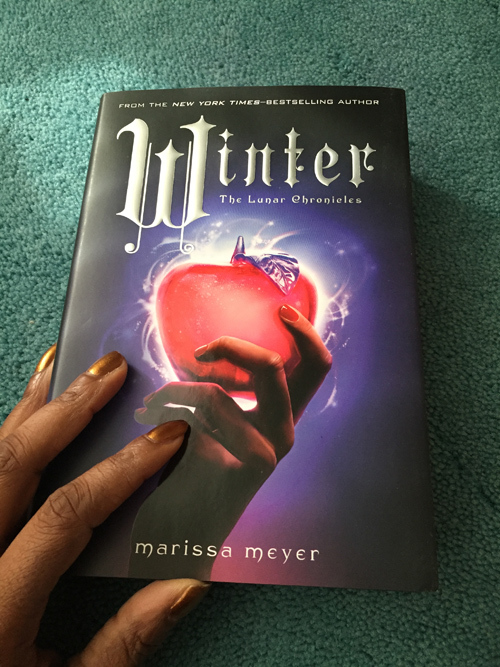 I have a couple of reviews I will be posting soon and definitely will review Winter when I complete it. Today is amazing! Next PostWhat do you do when one of your most anticipated books arrives on your doorstep? Previous PostCleanse Program: Part Deux! !